Since I write Regency-period historicals, I'm always on the lookout for tidbits of information about that era -- and how they relate to today's world. So I was intrigued to find out why a stylish modern man leaves the bottom button unfastened on his vest. 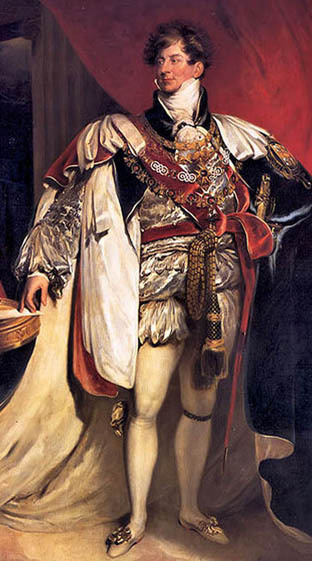 It's because the Prince of Wales, Britain's regent ruler during the 1810s and the reason the Regency period got its name, was ... well, let's just say he got pretty portly over the years. When his stylishly-tight clothing got to be uncomfortable, he'd unbutton something. Finally, he just started leaving the bottom button open all the time. So when your guy gets dressed up in a three-piece suit, he's paying homage to a British ruler from two hundred years ago. The illustration here is of George as a young man -- or perhaps the artist just knew how to flatter his patron. Here's another interesting tidbit. In the US we call the third piece of a three-piece suit a vest, but in Britain, it's called a waistcoat. What Brits call a vest is what we American's call an undershirt. So you can imagine how silly it sounds to a British reader when an American author refers to leaving the lowest button of a vest unfastened. Sigh. As playwright George Bernard Shaw once said, England and the United States are two countries "separated by the same language." And that brings up a question. Have you faced a situation where it was tough to make yourself understood -- or tough to get what the other person was talking about -- because of an oddity in the language? Interesting. I was in London once and asked for directions to a water fountain. A kindly museum docent directed me outside. I thought there might be one just outside the door, but no. I asked a couple people, and finally someone realized I wanted a drink. "You want a bubbler," he said. "A fountain is in the center of the square." Who knew? On a visit to a cousin in southern England I was given a bit of a tour. After several instances where she pointed out fields with corn (sp?) that looked suspiciously like wheat, I finally told her I didn't see the corn. After some discussion, I found out that what we think of as corn, the English call maize, and corn for them is just a general term for grain. It looks strange with much these clothes on for the person in ancient time.